" Emmy" is a very cobby little female, short-backed with a lovely head, a nice tail set and beautiful clear eyes. She is a very active girl, highly intelligent with a endless desire to learn. This girl is tireless ! Emmy loves hiking in the forest with our boys. With her compact structure and boundless energy, no wonder she stays a trim 42 lbs.
" 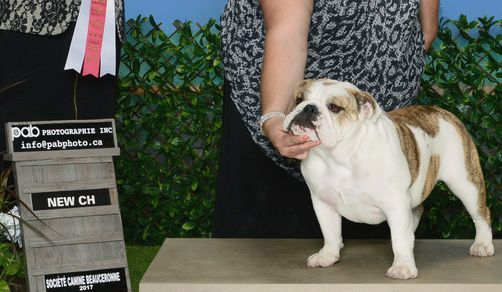 Thumbelina"finished her championship at 16 months old. 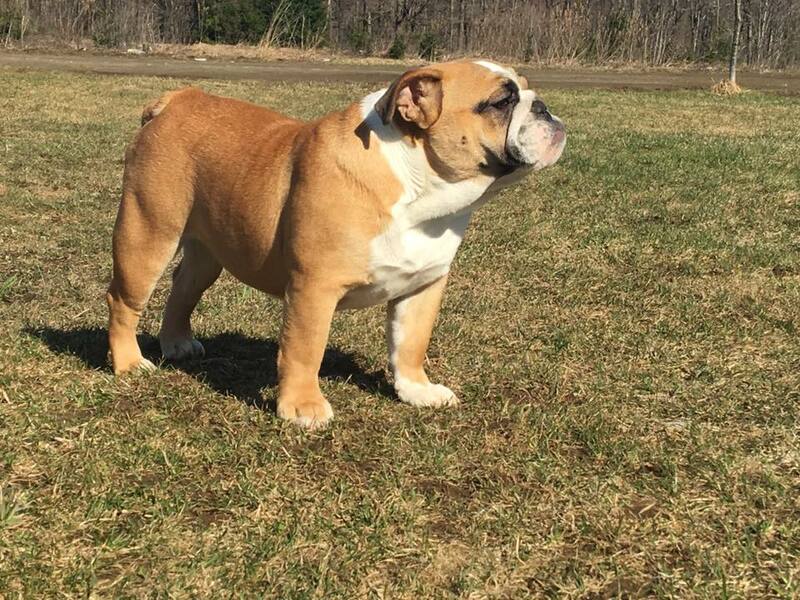 She is a half sister to our Emmy, but they are very different in personality and appearance but each bring something important to our breeding program. She is as calm and cuddly as Emmy is ever-busy and fun-loving. Lina has heavy bone structure, a nice top-line, well-turned shoulders, a wide and deep chest and large rib cage. She has a broad skull with well set ears, beautiful length and width of jaw. Lina is a solid 46 lbs. "Deli" has made her debute into the dog show world, she is a lovely, laid-back, standard sized girl. She has a broad pronounced forechest, deep brisket, large bone structure, and a lovely compact body. However not all dogs have the showy pizzazz personality to make great show dogs. Poli is being withdrawn from the dog shows for this year to find activities that bring out her inner sparkle and will return to shows in 2019. "Maiko"was only 2 points away from her championship at 8 months old!! 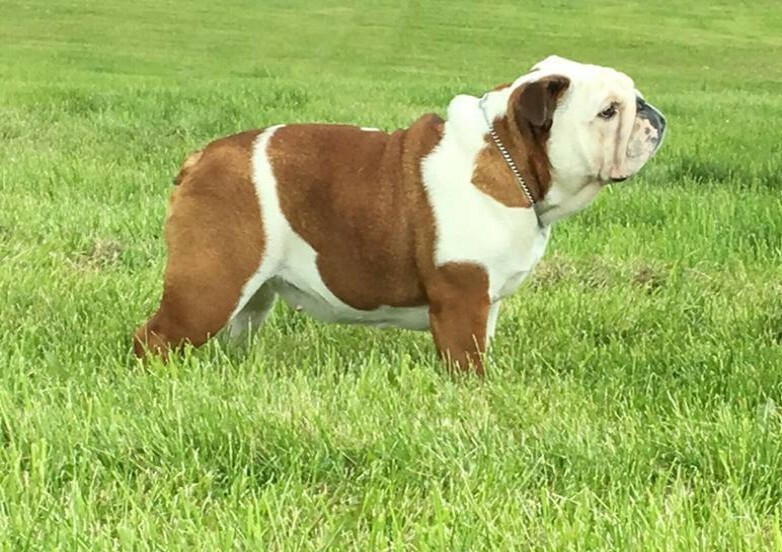 She was acquired from our friends at Bullynault and Bulld'or, but her pedigree carries the same bloodlines that form our own breeding program. I can not lie, the first thing that drew me to her was her coloring. I admit it, however I would not have decided to make her ours if she had not embodied so many valued traits of the breed, as well as her color ! Maiko has a stunning head in all ways. Her body has never gone through an awkward teenage-stage, she has stayed consistently thick-boned, compact and well proportioned. This little girl is so well balanced in every sense of the word. From her smooth, easy-going temperament to her flawless appearance. 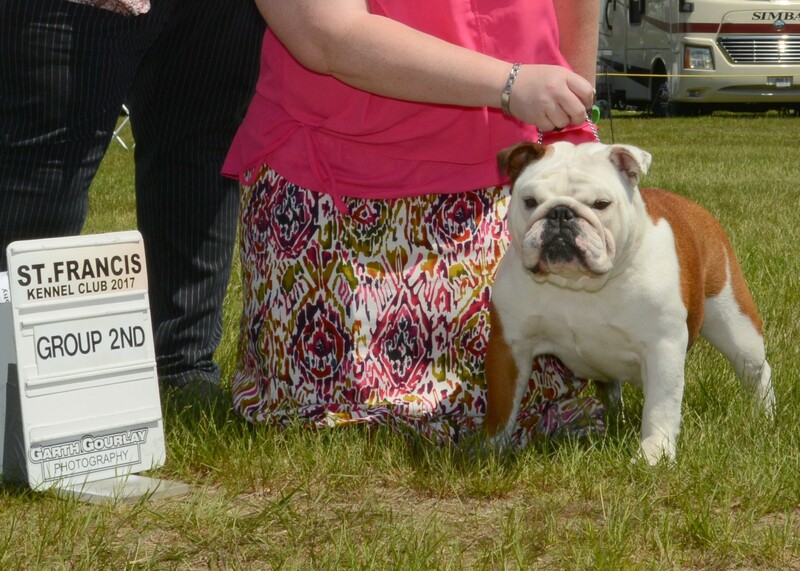 I am very excited about her future in the show ring as well as her eventual impact on our breeding program.